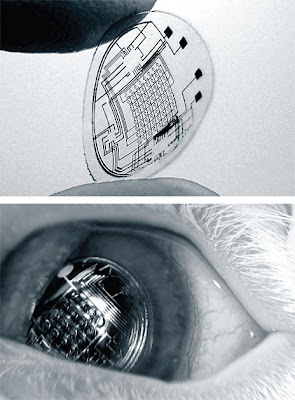 A new generation of contact lenses built with very small circuits and LEDs promises bionic eyesight. The technology is still in its early stages, but in recent trials, rabbits wore lenses containing metal circuit structures for 20 minutes at a time with no adverse effects. Babak A. Parviz reported earlier this month that his team of scientists at the University of Washington have successfully built a human contact eye lens with a LED powered wirelessly with RF. 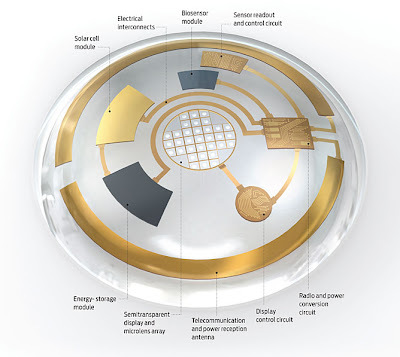 "A contact lens with simple built-in electronics is already within reach; in fact, my students and I are already producing such devices in small numbers in my laboratory at the University of Washington, in Seattle" says Parviz. "These lenses don’t give us the vision of an eagle or the benefit of running subtitles on our surroundings yet. But we have built a lens with one LED, which we’ve powered wirelessly with RF. What we’ve done so far barely hints at what will soon be possible with this technology." According to Parviz, these lenses don’t need to be very complex to be useful: with basic image processing and Internet access, a contact-lens display could unlock whole new worlds of visual information, unfettered by the constraints of a physical display. Besides visual enhancement, noninvasive monitoring of the wearer’s biomarkers and health indicators could be a huge future market. Parviz and his team have built several simple sensors that can detect the concentration of a molecule, such as glucose. Sensors built onto lenses would let diabetic wearers keep tabs on blood-sugar levels without needing to prick a finger. "The glucose detectors we’re evaluating now are a mere glimmer of what will be possible in the next 5 to 10 years. Contact lenses are worn daily by more than a hundred million people, and they are one of the only disposable, mass-market products that remain in contact, through fluids, with the interior of the body for an extended period of time. When you get a blood test, your doctor is probably measuring many of the same biomarkers that are found in the live cells on the surface of your eye—and in concentrations that correlate closely with the levels in your bloodstream. An appropriately configured contact lens could monitor cholesterol, sodium, and potassium levels, to name a few potential targets. Coupled with a wireless data transmitter, the lens could relay information to medics or nurses instantly, without needles or laboratory chemistry, and with a much lower chance of mix-ups." Babak A. Parviz states that the true promise of this research is not just the actual system they end up making, whether it’s a display, a biosensor, or both. He already sees a future in which the humble contact lens becomes a real platform, like the iPhone is today, with lots of developers contributing their ideas and inventions.